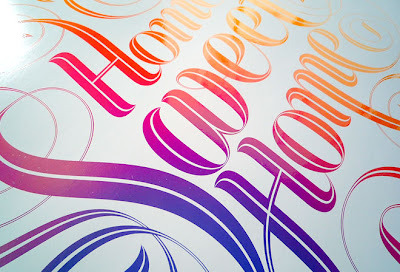 For those of you lucky enought to be in Newcastle this Thurday, 6th August be sure and head over to the Electrik Sheep Gallery, who are hosting an exhibition of beautiful typographic work from Seb Lester. Seb was trained at the renowned Central Saint Martins here in London and is internationally known for his typeface designs and illustrations which have been used by many of the world’s biggest companies and publications including Intel, The New York Times, The Sunday Times, Penguin, Faber & Faber and GQ Magazine. His first solo show at Electrik Sheep will include a full body of work, including a number of new limited editions and original which will be exclusivly available at the gallery. These will complement a selection of his well known back catalogue of work which documents his recent foray into the world of art. The show opens on Thursday August 6th at 6pm with one of Electrik Sheep's infamous street parties and an after party atthe Forth Hotel. All pieces will also be released online at the same time for those of you unable to make the trip to Newcastle with prices from £25 - £200 for prints.